Drinks inspired by the mighty tick. From right to left: Big Blue Moon, Mighty Blue and Blue on Ice. Yesterday a much awaited item to add to my arsenal of drink making tools arrived in the mail – a genuine bar spoon complete with twisted handle and metal disc on the end. With spoon in hand, I spent the next half hour waiting to yell “Spoon!” to my Tick loving hubby, who was in meetings… oh so many meetings. So with the thoughts of blue drinks coursing through my mind, I set upon a mission to make a new drink inspired by the Tick – something big, blue and powerful. Here is my Ode to the Tick. This first drink is inspired by spiritdrinks.com recipe for Angostura Stinger. The recipe is a blend of mint, chocolate, orange, cream and bitters. Creating similar ingredients sans-booze was not difficult but took a few steps. The taste of the white chocolate and cream mix well with the flavours to create a sweet powerful flavour that is best sipped. I omitted the bitters as the home version of the curaçao tends to have that component. Great for a dessert beverage. Taste: 4/5 nice blend when you keep the mint syrup light in the mix. Simplicity: 3/5 Three recipes to make, but nothing hard to do. Ingredient finding: 5/5 Local Local Local. Heat whipping cream in saucepan on medium high. When heated add chocolate chips and stir until melted. Remove from heat and pour into container to cool. Keep in fridge until use. Mix water and sugar on medium high in a sauce pan until sugar is dissolved completely. Add extract and orange peels and continue to heat for 5 minutes. Remove from heat and allow to cool. Give the ingredients a chance to infuse for half hour then tint mixture with food colouring to desired degree. Strain out peels and store in air tight container in fridge until needed. The original Blue Moon includes vanilla, cream, curaçao and orange juice but I wanted something fizzy and the rating on the recipe was not inspiring. The Blue Duck blends curaçao, vanilla and raspberry together in a martini flavour, this had potential to update with a fizzy twist. And I could use my new “Spoon!” to not only measure some ingredients but also to try a stirred drink. Measure vanilla, lemon juice, blue curaçao syrup and blue raspberry mix into a martini glass. Stir to blend and pour into two 10 oz old-fashioned or highball glasses. Add Ice and top with club soda (about half can per glass). Stir again to mix and serve. This is a very tart drink. The pure vanilla can become overpowering, so care has to be taken to make sure the other flavours are in correct proportion. If you prefer something sweeter, use Sprite. I first tried this without the raspberry mix, forgetting I had an additional blue ingredient in my pantry. Without the added ingredient the beverage was too sour and the vanilla dominated the blend. Adding that one extra ingredient changed the mix to something worthy of writing about. Why the name Big Blue moon when the drink is far from the original? Well the tick doesn’t talk at all about ducks! Kid-o-metre 3/5 with the addition of blue raspberry, this drink was acceptable but not guzzled down when served with dinner. Taste: 4/5 Tart and good when thirsty, would be good with salty tortillas and dip. Simplicity: 5/5 one recipe, simple to make, rest is all bottled ready to use from the local store. Ingredient finding: 5/5 Small town possible. Divide blue curaçao syrup between two shot glasses. 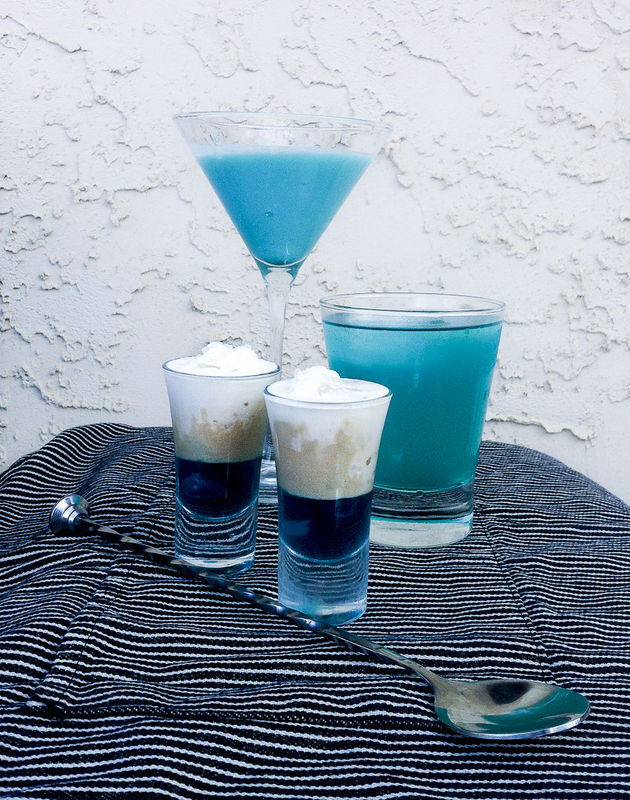 Carefully layer Irish Cream Syrup over the blue syrup. Toss the cream and ice into a blender or magic bullet and use the ice chop setting if you have one to crush the ice into slush. Spoon over each drink and serve. I originally tried this with the two ingredients from the original recipe. Because of the lack of the alcoholic bite, the final drink was too sweet and needed something new to cut the flavours. So I decided to try layering cream on the top. Even with whipping cream the density of the two top ingredients was too close and after four attempts I realized I had to be creative to get that final ingredient layering on the top. Inspired by the Maple Leafs who spend all their time on the ice, I decided to throw caution to the wind and toss the cream into a blender with a little ice, creating an iced cream that happily sat on top of the drink looking like a pile of ice shavings from the Zamboni. I left these two drinks sitting for my kids to try, by the time they got home from school the iced cream had melted into a froth, leaving white moustaches on both girls after they tipped the drink into their mouths. I am guessing there would be a small brain freeze with the original, not a problem for such as the tick, who has such a small brain to start with I am sure it would never be affected! Kid-o-metre 5/5 Whether it’s melted or iced, this drink is pure yum! Taste: 5/5 Gotta be good if it’s inspired by hockey right? Simplicity: 3/5 This one takes skill baby! Ingredient finding: 5/5 Even up north, these things are easy to find… especially the ice! This is the recipe from Allrecipes.com for DIY Original Irish Cream. I just omitted the whiskey! Add all but cram to blender, blend well then add cream and blend again. Pour into container and store in fridge. Lasts about 1 month refrigerated. Posted on October 22, 2014 October 22, 2014 by orionssong	This entry was posted in Bitters, Cocktail, Drink Mixing Tools, Layered Shooters or Pousse-café, Sodas, Syrups and Infusions and tagged Blue, Cream, curacao, Irish Cream, orange, The Tick, Toronto Maple Leafs, white chocolate. Bookmark the permalink.